The Jesus In Jeans™ wall stickers were created to help customers quickly add life and color to walls without the mess and fuss of paint. 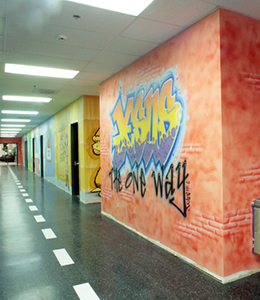 Each wall sticker is professionally drawn and colorized for maximum visual appeal. Our line has evolved to include Jesus In Jeans™ characters in a variety of poses and settings. Creative for Kids™ has also created a line of Background Mural Kits (sold separately) to complement the wall sticker line, enabling customers to create a professional-looking murals quickly and at a fraction of the cost of custom designs. All Jesus In Jeans™ wall stickers are available in two sizes, life size and reduced (30% smaller than life size). They are printed on demand using a large-format printer with durable inks. The material is a matte finish vinyl with a semi-permanent adhesive back that allows for careful repositioning without damaging the sticker. Allow 30 days drying time for freshly painted walls so that the paint has time to cure before applying wall stickers. Once adhered to the wall, the sticker surface can be cleaned with a soft, damp cloth using water and/or mild soap if required. Jesus In Jeans™ wall stickers are designed to be directly applied to flat surfaces only. Stickers may buckle, curl, or peel if applied to surfaces of a rough or uneven texture. Creative for Kids™ recommends that stickers be applied to wood cutouts that can then be attached to cement block or textured walls using liquid glue or screws.